At Budget Blinds of Airdrie, we're your local neighborhood experts that truly understand your needs. We're in your neighborhood, we know the local Airdrie weather and community, and we’re backed by the #1 provider of blinds, shades, and drapes in North America. Over 25 years of customer satisfaction gives you peace of mind that only comes with choosing the proven leader. We bring the showroom to you in Airdrie. We expertly measure your space, install beautiful window treatments, and back it up with the best warranty in the business so you can sit back and relax in the beautiful, Airdrie weather and sunshine. We serve to give you the best in window treatments, so you can rest easy knowing your space will be beautified and optimized with window treatments that fit your individual needs. We are passionate about making this process as EASY and efficient as possible for our customers! We love helping people to find the BEST window coverings for their style needs and budget! If you’re in the Willow Brook, Airdrie Meadows, the Sunridge area or anywhere in-between, you’ve come to the right place for stunning window treatments that reflect your unique lifestyle. That’s because Budget Blinds of Airdrie & the Chestermere Area is here to design your customized look and help you see your windows in a whole new light. From stylish blinds and shades to energy efficient genuine wooden shutters and elegant drapery, isn’t it time you brightened up your day the Budget Blinds way? As a locally-based, family-owned business, Budget Blinds of Airdrie & the Chestermere Area like you, is active in our community. And as a Winning Edge Award winner and member of the Airdrie Chamber of Commerce, we know what community-focused is all about, and we ensure you’ll be pleased with our personalized service and attention to detail that makes us your first choice for premium window fashions that perform beautifully year after year. 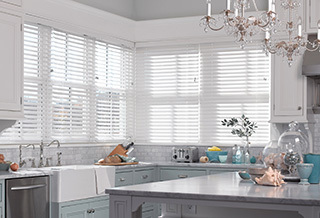 So from Woodside Estates to Jensen, for any size window shape or size, reward yourself with new, custom blinds, shades, shutters or draperies that elevate your home’s décor and garner compliments from friends and family. Make the call today to and schedule your FREE in-home design consultation. You’ll see why we’re proud to say, “we do it all for you”! We absolutely LOVE our community and taking every opportunity possible to connect, support, and encourage our people! Thank-you to all of our customers for supporting us so that we can support the community in return. Always a pleasure doing business with Airdrie Budget Blinds. Sarah was fantastic, no pressure sales, knowledgeable and super friendly. – Tracy & Mark W.
Our consultant Susan is amazing! No pressure and educated us on our options. She is amazing and Budget is so lucky to have her. We are repeat customers and will continue to be because of her and how she treats us. – Angie & Jeremy F.